Kevin caught a nice salmon or 2 and gave a lovely 3 pounder to us. I stuffed the cavity with sliced garlic, lemon, parsley, chives and plenty of fennel. Plenty of salt all over and drizzle olive oil over top. Bake at 325F for 60 minutes. 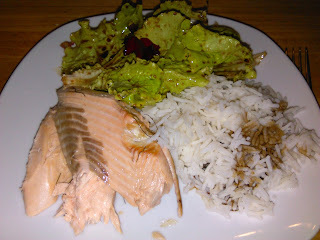 The fennel and salmon smell filled the kitchen while it was cooking making my mouth water the whole time. It tasted as good as it sounds. The rice just had soy sauce in it and the salad was fresh greens with a vinaigrette of olive oil, balsamic vinegar and salt. Simple but you can't beat fresh caught salmon.